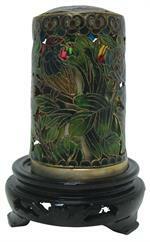 Item #91X0406: 4" Plique A'Jour jar with wood stand. 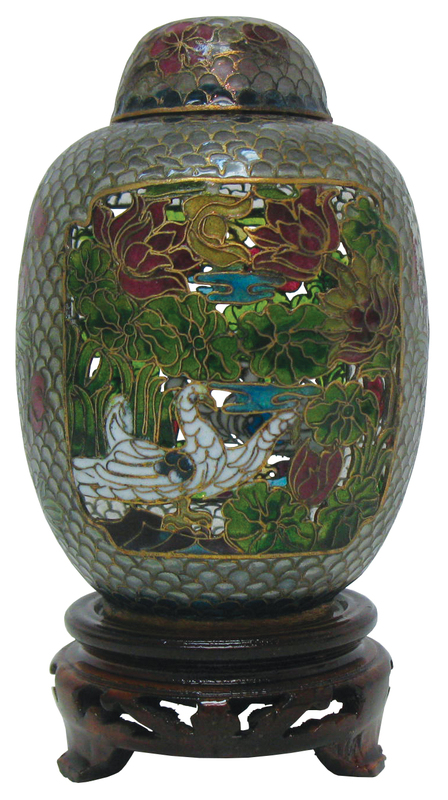 Item #CC-S3022312005: 2 1/2" tall pair of Cloisonne ginger jars with 5/8" wooden stands. Available in your choice of blue or black background. Item #IGM-53204-28: 3 1/4" tall Cloisonne jar with lid in assorted colors. 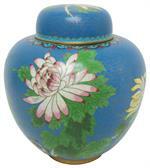 Item #CL-451: 7 3/4" tall Cloisonne jar with lid. 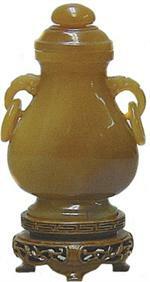 Item #C-19: 2.5"x4.25" tall Butterscotch Agate Jar; Mounted on 1" wood stand. 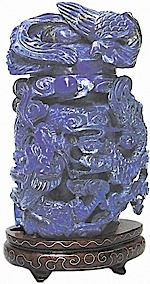 Item #GS-478: 2.5"x4.5" tall dark Blue Lapis Lazuli Dragon and Phoenix Jar; Pyrite inclusions; Removable lid; Mounted on .75" tall wood base. Item #91X0407: 3.25"x2" Plique A'Jour box with wood stand. 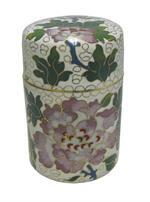 Item #X0460: 4.5"x2.25" Plique A'Jour box with wood stand. Item #93X0303: 3"x1.75" Plique A'Jour box with wood stand. Body lifts up to reveal metal cylinder. 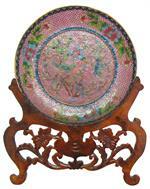 Item #X0834: 8" Plique A'Jour plate with wood stand. 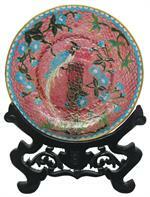 Item #CL-465: 5.5" Plique A'Jour plate with wood stand.